Deriva Mussol is led by Jordi Lafon and Eva Marichalar-Freixa in collaboration with everyone interested in their proposals. Their long professional record in education and visual and performing arts, brought them to embrace walking practices as a way to explore endless possibilities for creation and learning in contemporary contexts. Helena Català Rodas, Blanca Garcias Castells, Guillem Vilamitjana Masramon, Ona Castellsagué Bonada, Georgina Martí Farell, Eva Marichalar Freixa, Jordi Lafon Guerrero, Anna Prat Fontseca, Mireia Planàs Serradell i Òscar Pujol Pladevall. transform and represent a particular territory, are the objectives of this project. Deriva Mussol, is part of the ACVic's Nursery projects in collaboration with the Aula de Teatre de la Universitat de Vic. 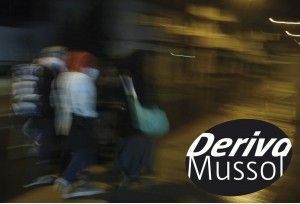 Deriva Mussol and Walk Exchange invite you to an hour and a half long simultaneous walk in the town of Vic and in the city of New York. To document the action, we propose, to anyone who wishes to do so, a field collection of objects, photos, sketches, writings, sounds and videos during the walk. The material gathered will be exchanged with New York, sent in a package by mail. This gesture will bear witness to our simultaneous action, expressing the intention to promote new relationships between cultural and educational communities. At the end, the two groups will share the experience in a Skype meeting between the Centre d’Arts Contemporànies in Vic [http://www.acvic.org] and Outpost Artists Resources in Ridgewood, New York, [http://www.outpostartistsresources.org]. Deriva Mussol will meet at 10 pm at ACVic (C. Sant Francesc 1, Vic), and will begin the walk at 10.30 pm*. The Skype conversation with Walk Exchange will begin, also at ACVic, at 12 midnight. The Walk Exchange will begin its walk at 4.30 pm at Outpost Artists Resources (1665 Norman St. Ridgewood, New York). The Skype conversation with Deriva Mussol will begin at 6 pm. A proposal by Deriva Mussol, with the collaboration of Osonament, the support of Obertament, and the participation of ACVic and UVIC-UCC. During the winter and spring of 2016, Deriva Mussol organised a group of people to go for a walk every Tuesday morning from 10 am to 12pm. Their intention with this new proposal was to create a group of walkers comprising sufferers, or former sufferers, of mental illness, and people who have rarely, or have never, met sufferers or former sufferers of mental illness, and so, through walking and talking, help to dispel the stigma surrounding such illnesses. The aesthetic dimension of walking, and the climate of confidence which emerged while sharing hours of walks and conversations, made it easier to talk about, demonstrate, and recapture their more poetic passions, those artistic expressions which, more intimately or more publicly, each of us realised in their daily lives. Having already Immersed ourselves in the process, they invited Adicciones Porquesí and Xef Vila to join their walks, and to produce, respectively, a publication and a documentary in which to collect together the whole story, and in which each participant might present whichever parts of their work they felt more comfortable in making public. During the months of Walkers activities Deriva Mussol discovered the skills and talents of the various members of the group, and enjoyed the collaborations between us when creating their pieces. This is what they wish to highlight and convey with this publication and this documentary, which will be presented on November 25th at 7 pm at ACVic, C. Sant Francesc, 1 Vic. The proposal received funding and technical support from Obertament, Aliança Catalana de Lluita contra l’Estigma en Salut Mental, and was carried out with the cooperation and involvement of Deriva Mussol and Osonament (FCMPPO). ACVic Centre d’Arts Contemporànies and Universitat de Vic UVic-UCC also collaborated during the different stages. Deriva Mussol are Jordi Lafon and Eva Marichalar-Freixa, in collaboration with all those who participated in the projects. From their respective careers in visual and performance arts and education arises an interest in walking and the derive as ways to explore possibilities for creativity and learning in contemporary contexts. They like to generate activities and share open, permeable, and dynamic spaces. Deriva Mussol is part of Projecte Viver of ACVic Centre d’Arts Contemporànies de Vic.